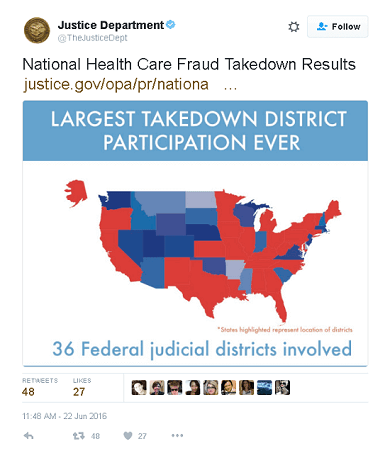 The Department of Justice (DOJ) announced on June 22 that it made 301 arrests in what's being called the biggest healthcare fraud takedown in U.S. history. 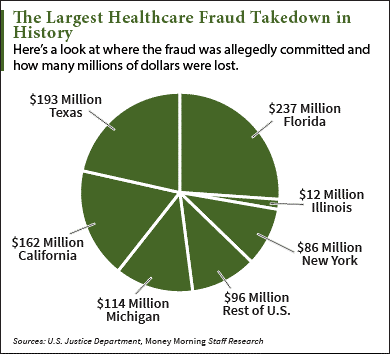 The Medicare Fraud Strike Force — part of a joint initiative between the DOJ and the Health and Human Services Department (HHS) — busted doctors, nurses, and other licensed medical professionals for allegedly running scams that bilked the government out of $900 million. And of course, when these healthcare professionals bilk Uncle Sam, it also means they're bilking U.S. taxpayers. Across the country, 23 states and 36 federal districts coordinated with the government to go after these alleged scammers. Six states stood out as home to the most costly collection of fraud schemes – Texas, Florida, Illinois, California, New York, and Michigan. A doctor in Houston, Texas, has been charged with bilking Medicare out of $18 million-worth of medically unnecessary home health services. In Florida, the owner of several infusion clinics stands accused by the federal government of defrauding Medicare for over $8 million in fake intravenous drug reimbursements. A clinic in Detroit that was actually a front for a narcotics diversion scheme billed Medicare for more than $36 million in services that were never rendered. Five medical professionals in Brooklyn, New York, were arrested for operating an $86 million Medicare and Medicaid fraud scheme in which they paid kickbacks to patients who received unnecessary physical and occupational therapy. Sixty-one of the approximately 300 medical professionals busted were charged with Medicare Part D fraud that involved the over-prescribing of opioid painkillers. As far as punishment for these scammers goes, the federal fine for reporting health services that were never performed is $10,000 per offense. If kickbacks were received, the fine goes up to $25,000. And that doesn't include restitution costs.